When you should use red, yellow or white. If you aren't already cooking with miso, it's time to fix the error of your ways. Miso can bring awesome umami qualities to everything from salad dressing to roasted vegetables. It's good for a lot more than just miso soup. Once you're ready to start using miso in just about everything, you have to sort through the various kinds of miso; that's where we come in. Here's a handy guide to the three of the most common types of miso you'll find in the grocery store, and how to use them. What it is: White miso (which is actually light yellow in color) is made with fermented soy beans and rice. It's fermented for a short period of time, which makes it more mild and sweet in taste. 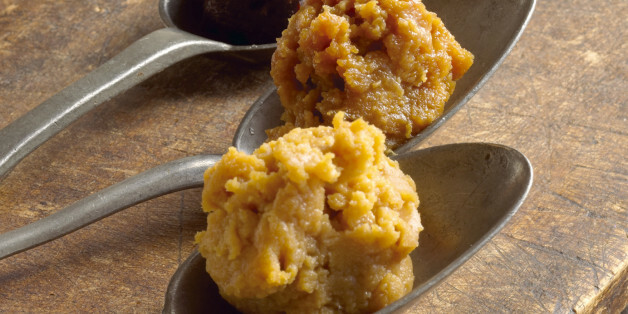 Since it's the most mild kind of miso, it's also the most versatile. If you're buying only one miso to use in a bunch of recipes, this is the best choice. What it's good for: Dressings, soups and light marinades. What it is: Yellow miso is often made with fermented soybeans and barley. It's slightly stronger than white miso, but not as strong as red. Just remember: Mellow yellow. It's light brown in color. What it's good for: Dressings, soups, marinades, glazes. What it is: Red miso is the saltiest, most pungent variety. You only need a little bit to add some serious umami to your dishes. It's typically made with fermented soybeans and barley or another grain. It ranges from dark brown to red in color. What it's good for: Marinades and glazes for heartier dishes, like meats and certain vegetables, such as eggplant.